Califone International has developed a new stand designed to hold tablets and large smartphones at the optimal viewing angle to allow students to use a Bluetooth keyboard with their mobile device. 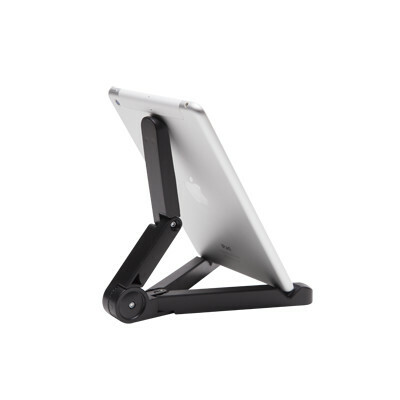 According to the company, the new TPT tablet stand can prop up tablets such as the iPad, Kindle Fire or Galaxy Tab, as well as mini-sized tablets and oversized smartphones in either portrait or landscape position. The stand folds into a compact size for storage and transport. When in use, the two leg bases open to a 75-degree angle and the back support can adjust vertically from zero to 180 degrees. In a prepared statement, Tim Ridgway, vice president of marketing for Califone, said, "Since all major assessments specify a mobile device’s onscreen keyboard be disabled, it was important to provide a variety of ergonomically correct display angles for optimal visibility of the device." rubber grips to keep devices in place. Califone offers the TPT tablet stand on its own or as part of the Califone Bluetooth Smartphone & Tablet Peripheral Pack, which includes the stand, the KB4 Bluetooth keyboard and 3068AV headphones.